It is week two of the One Room Challenge and we’ve made some progress in the dining room (Click HERE to read about week 1). Hurricane Matthew threw an unexpected wrench in our makeover schedule. The storm was quite scary and we were trapped in our home for several days due to severe flooding. Thankfully no water entered our home and our cars and family were safe. I’ll try to get a post out later today tell you all about our experience with the hurricane and show some photos and videos of the horrible flooding. Being trapped inside the house gave us time to choose a new paint color for walls and for the table base and chairs. Our 1st floor has a very open design concept and therefore choosing a paint color palette which flows and coordinates from room to room is important. Our newly renovated kitchen is painted in Comfort Gray, the kitchen island is Oyster Bay and the family room, front music room and foyer are Sea Salt. All of those colors are a very cool and calming neutral palette of blue gray with green undertones. Now it was time to find another color, but lighter, with those same undertones. I have to apologize. Trying to capture the slight nuances of the paint colors with my camera was nearly impossible! They all look nearly the same but on the walls they are quite different. This is why you must never trust what you see on your computer screen and think it is the true color. 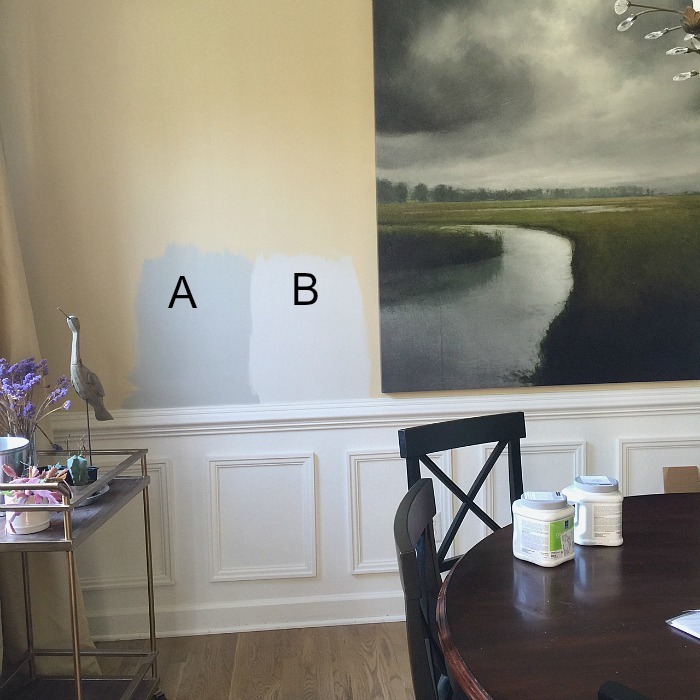 Always, always, always paint a sample on your wall in large swatches and see how you like it in different lighting . Remember too that you should always paint on at least 2-3 coats of paint on the wall swatch because otherwise the color underneath will show through and distort the overall color that you see. Our walls had been painted in Sherwin Williams Ivoire, a soft buttery cream. Sherwin Williams sells 1 quart paint can sample (which can cover a huge amount of wall space!) for only $5. It’s well worth buying a few colors to try out before you commit. We narrowed our color choices down to (A) Silver Strand (SW7057) and (B) Reserved White. The huge painting in the dining room, Storm Over the Marsh by artist James McLaughlin, is the main focal point in the room and was a considering factor in wall color choice. 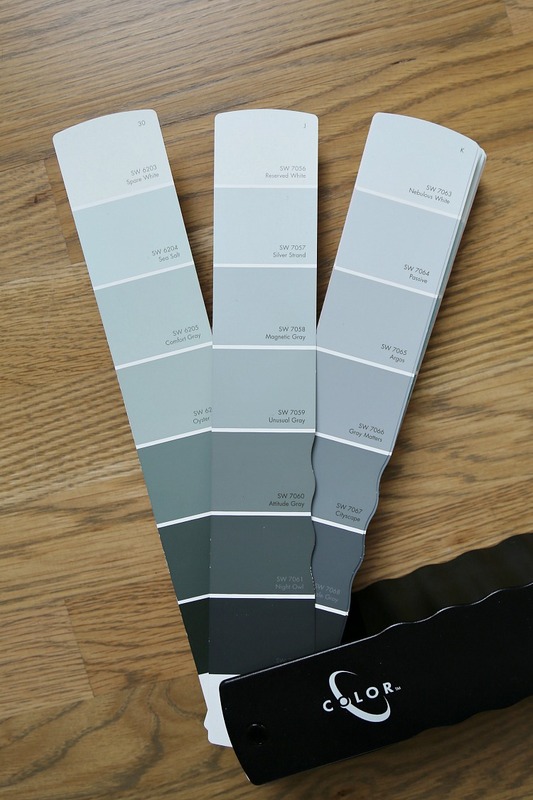 I really loved both shades of gray but the winner paint color was Reserved White! The Silver Strand was a bit to close in color value to the Comfort Gray. The wainscoting or picture frame molding is painted in SW Extra White. Unfortunately we never bothered to re-paint the crown molding to match the wainscoting, so it is still a yucky cream color along with the ceiling. I’ll finish that up later this week. Time to paint the ceiling! Oh my goodness, talk about making a huge difference! If you have a dark room and haven’t painted your ceiling bright white then you will be wowed by how brighter your room will look afterwards. The dining room celing was the last room left downstairs that hadn’t been painted. 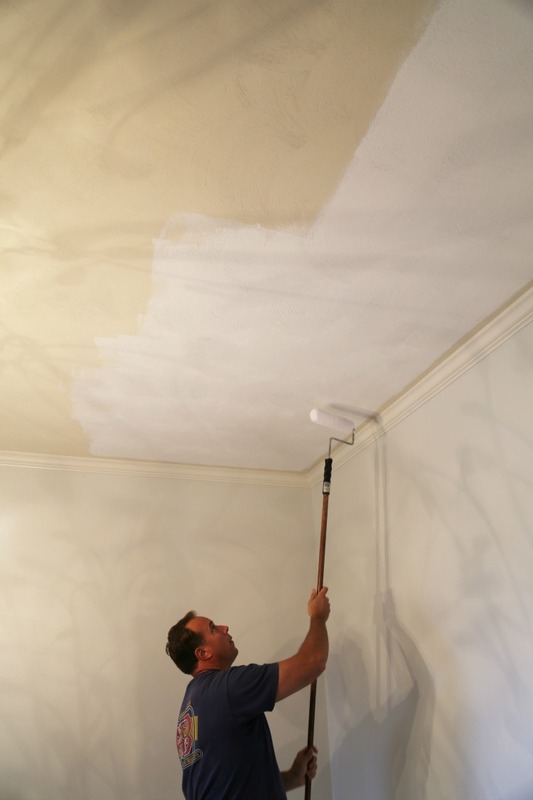 Click here for my tips for painting a ceiling, what type of paint to use, and the type of roller I recommend. The next step will be painting the table base and chairs and I’m still debating on what I can do, if anything, with the reddish veneered tabletop. Time to get painting! Be sure to check out all the other participants in the One Room Challenge by clicking on the logo below!